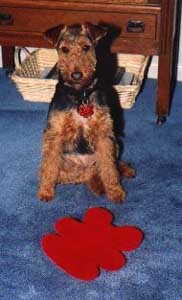 The Welsh Terrier – photo provided by a PGAA visitor – Thanks! The Welsh Terrier, like most terriers, is playful, willful, intelligent and alert. It will need firm and consistent training, but not harsh. It is very clever and will take control if allowed. They love to dig about as much as they will love to chase your cat, your small, rodent-like pets, or give “puddy-tat” a run for Tweetybird. They will do much better with a family that can equal their demand for exercise and fun. It could be difficult to housebreak. The Welsh Terrier needs lots of exercise and playtime, and will do better in a home with a fenced yard. This terrier should be brushed several times a week. Wiry Daily OK for apartments with regular exercise. Good with children. Like to be part of an active family.